My card today is a mix of old and new. I've been on a mission to use up some of my older papers and embellishments - but it's only fun if I can add in something new. The new is that diecut butterfly from Simon Says Stamp. 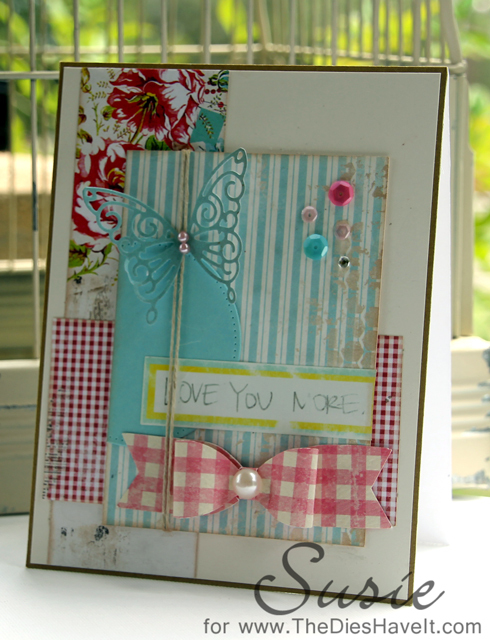 Everything else is from an older paper pad, an old sentiment sticker or plucked from my random embellishment box. I managed to use up quite a bit on this one card. So I'll say mission accomplished on this one! This is spectacular, Susie! I must admit I'm jealous...I can't find time to get in my craft room!